These 2 little girls are demon possessed, and I’m sure they learned about Satanism from an adult. I’m curious as to what “scary movies” they were watching prior to this happening. Go look at the pictures and read what they wrote. And a pizza cutter? Some of you will get the suggestion of what is going on here. “Bartow is located in the heart of Florida’s citrus belt. The girls planned to stake out a school bathroom and wait for smaller students to enter, according to the police affidavit. They planned to cut their victims’ throats, cut up their bodies, eat the flesh and drink their victims’ blood, authorities said. The students then planned to fatally stab themselves. Detectives said the girls devised the plot while watching “scary” movies at one of their houses over the weekend. And what’s up with the pizza cutter? I think it’s safe to know what demonic spirit is behind these girls. Does pizzagate ring a bell? Bartow comes from the name Bartholomew who was of an Apostle of Jesus who was martyrd. He was said to have been fillayed and beheaded. Strange connection here to what these girls wanted to do right? The name means son of Talmai. It “Means “furrowed” in Hebrew. In the Old Testament this name is borne by both a giant and also the father of King David‘s wife Maacah.” A furrow is an agriculture term for planting seeds for a harvest. “a long narrow trench made in the ground by a plow, especially for planting seeds or for irrigation.” Should we be surprised that those reapers of this demonic harvest happened in Bartow? We honestly shouldn’t be surprised that 11-12 year old girls would think about killing, then eating and drinking the blood of little kids. It is being instilled in them from tv to “art” to music to pop culture. They are a generation that has more than one door of entrance for demonic possession. In regards to the Bartow incident, these girls got this idea to do this from “scary movies”. I used to love horror movies but in the last year I just can’t watch them. They have gotten so bad demonically speaking that I actually had a nightmare from Hereditary. Lol. I’m not even joking. I tripped out that I actually had a nightmare that woke me up scared. That has never happened to me. I honestly think that the veil spiritually is so thin that it now affects movies and tv. We can see this in electrical devices as well (phones, tablets, ect). It’s always been there, don’t get me wrong, it just got a lot thinner with AI and the IoT. If you are a honest researcher of scripture and don’t mind being offended than please listen to this. I don’t know or follow Nehemia Gordon other than I do know he has a pretty extensive background in the Hebrew language. If you didn’t like him for whatever reason than don’t listen to this, but trust me, you will be missing out on some interesting research. I will write on this in the next few days. There are a few things I can add to his research, other than that, it’s got a solid foundation to stand on. Their god is Jupiter. William Branham and Arnold Murray made the serpent seed doctrine popular in our modern era. Even more recent you have dudes like Jonathon Kleck feeding this doctrine to unstable Christians that is doing nothing but fleecing the flock. These guys didn’t make this false doctrine up though…it comes from the Targum of Jonathan from Palestine. I recommend that you read it for yourself if you haven’t already. So you can see that this doctrine comes from a falty interpretation. So for $200-$350 you can now let Facebook follow you around. If it wasn’t bad enough that Facebook (like Google) listens to every word spoken around your phone then sends you sponsored adds and has the tech to actually read your mind. I’m so serious about this that I wish I was joking. Amazon has Alexa wanting to control everything in your life and now Alexa is connected to FB Portal. We know FB is the storefront for the fffbbbiii and we know that Amazon cloud is run by our military. I’ve written about all of this in the past…go to my blog (www.hiddeninthecrag.com). Now this Portal gives AI a literal looksy into your “private” domain. They just don’t want to hear every second of your life, they want to see it. We know Snapchat is used for facial recognition (https://youtu.be/eMolGPyP6Fw), you can’t argue that. But what is this Portal actually up to? Well, I think it is going to be used for sinister AI tech. Remember the Adobe program I wrote about that allows someone to change someone’s conversation in real time? Or the tech that can take a live video and make someone say something they didn’t say? It’s real people….kind of. This is the pinnacle of blackmailing normal people and ruining their lives. AI is replicating each and every one of us in this artificial world. FB Portal is doing just what the name implies. It is sending physical information of you to the “cloud”. It is creating another you with the help of programs like this. It follows your every movement, mannerism and gesture. They already have your facial recognition and now that need the rest of your body. Imagine waking up one morning and seeing yourself on national news where they are claiming you did something you know you never did. It’s your voice. It’s your body. But it’s not really new. How could they do this? Easy…they already have all your info. Now there are 2 of you. And that’s just the beginning of this portal. We know what a portal is…a gateway or doorway to somewhere else. But where? Is it coming or going? And the funniest thing is that people pay to have this in their lives. We all have a cousin Alexa nowadays. What also concerns me as far as techy AI coming out is Googles new Top Shot Pixel 3 phone. I always thought it was weird how iPhones had that second of live action on pictures. Like seriously, how did they do that? Well Google’s new phone does that same thing but then actually picks a picture for you that is better than the one that was taken by a human. The big talk from people isn’t the fact that AI is taking video of you prior to you actually hitting the shutter button but is today the resolution isn’t as good. Really? That’s your concern? Think about it? AI is taking video and starting the recording process prior to you pressing the shutter button on your phone. If that doesn’t scare you well you are probably the one who will get all of the IoT AI tech. I am curious to know if AI machine learning starts the recording process as soon as you get in picture mode or is it always recording? Either way, it doesn’t matter. I don’t want AI making decisions for me or watching my every move. Google Lens is also included in this phone. They advertise it as “search what you see”. So our phones are not only listening to us 24/7 but also watching us 24/7. I mean come on, why not pay Google $900 for this phone so they can listen in and watch us. I like reggae. Not going to lie. My last band was a “reggae” band minus all of the weed connotations. I could do without all of the weed, ganja, puff puff pass lyrics in reggae music along with all of the occult and esoteric symbolism. Very rarely do you hear a good reggae band anymore that doesn’t sing about smoking weed (but fortunately they are out there). When I write something it is normally based off of prior research that is just another piece of the puzzle. But sometimes I just get a feeling and without thinking about it, I just blurt it out. That’s what I did with the “smoking weed is communion with Shiva” comment. It was off the cuff with no prior thought into it. I was as surprised as some of you to see how strong those ancient connections were. I did this same thing with a band that I like called The Elovators. I had this gut feeling and then a friend of mine mentioned something about them. Probably also having that first instinct gut feeling. I’ve known this band before they had gotten “big” and had a few conversations with them. After I wrote this about them (https://m.facebook.com/story.php?story_fbid=1492720827504131&id=519754571467433) I really started to notice a pattern. In their defense I will say that their first album wasn’t all about smoking weed but you could still sense a new agey bigger from them. Things started to change though. At one point I even asked them if they knew about all of the esoteric symbolism that was in their posters and covers. Oh yeah, they knew and didn’t have a problem repping it. Above photo breakdown: Meridian is a high point of the day that usually takes place at noon. It is the zenith (point of contact from above) or can also be a set of pathways in the body along which vital energy is said to flow. These are known as chakras in the demonic new age mystical teachings. You will see an example of this meridian in the form of lights on The Elovators “So Many Reason” single cover. Also notice the vsmoke covering the left eye. The one eye symbolism is a mo brainer, we all know that represents the eye of Horus (the all seeing eye). Looking at the Shiva research we also know it represents his “third eye”. This is the point with all of this research, to get you to recognise and see (pun intended) that smoking weed is connected to the worship of Shiva. Not only in Hinduism but we see this all coming to a forefront in reggae music. Is nothing new, remember that. Also notice the smoke over her left eye. In my paper on the mist on the Temple Mount, I tell you how way this all represents. Smoke is symbolic of a veil between our natural world and the spiritial realm. “In some esoteric circles, they believe the mist to be a veil between worlds. We saw this in the Stephen King series The Mist where they continuously referenced the book of Revelation (the unveiling) of Jesus Christ. So there does seem to be a connection to the mist being a sort of covering. Remember, the original Hebrew word ed refers to it as enveloping something.” “Remember in my paper on the etymology of the word for ashes in Hebrew was directly associated with a bull or heifer sacrifice? Well you’ll like this one too. The word mist in Hebrew is אד and is “from an unused root meaning to gather, shared by אוּד‎ (“a burning piece of wood, a firebrand, an ember”).” In English it sounds like ed. It is a vapor or smoke type of mist.” Read the paper here. Once again, all this symbolism in pro-smoking weed bands is just making it easier for me. So that brings us to now. They released their first single off of their album “Defy Gravity”. Obviously it’s a thumbs up to eastern mysticism and meditation but they also made new stickers with a UFO on it. We can see where this is all headed. So anyways, they come out with this new age picture for a single and its got this girl with the kundalini chakras gong through her. Not surprised. What I was surprised was that new ager Ram Dass was repping this same picture. What’s my point? Even when you try to give someone the benefit of doubt and let them plead ignorance on your behalf, they really do know what they are doing. Remember the saying our parents told us? Your known by the company you keep. It’s true with The Elovators. And I could break down the esoteric symbolism in the photos below but I think most of you have enough discernment to see through it all. Symbols mean everything to the students of the esoteric and occult world. Your layman doesn’t understand this. It’s all demonic. Below is the symbol for THC. “The ennead–9–was the first square of an odd number (3×3). It was associated with failure and shortcoming because it fell short of the perfect number 10 by one. It was called the number of man, because of the nine months of his embryonic life. Among its keywords are ocean and horizon, because to the ancients these were boundless. The ennead is the limitless number because there is nothing beyond it but the infinite 10. It was called boundary and limitation, because it gathered all numbers within itself. It was called the sphere of the air, because it surrounded the numbers as air surrounds the earth, Among the gods and goddesses who partook in greater or less degree of its nature were Prometheus, Vulcan, Juno, the sister and wife of Jupiter, Pæan, and Aglaia, Tritogenia, Curetes, Proserpine, Hyperion, and Terpsichore (a Muse). According to Hindu tradition, Shiva was 9 feet tall. Shiva is called the destroyer but the number 9 is never “destroyed”. The 9 is also an upside down 6 and represents PHI. Notice how 9 and PHI the golden ratio match. Below is what is called the eye of Shiva. It lools like PHI when its jewelry is made. Notice that the tail of the eye of Horus is PHIesque looking. The eye of Shiva represents their “consciousness” within the trikona. Now you know what the eye represents on or in the pyramid. The third eye is being opened when you smoke weed. Once again, that’s why it is called a gateway drug. In witchcraft the Triangle represents their divine feminine goddess. The mother, maiden and crone. In other esoteric thoughts it represents the divine masculine. Their god Shiva. Trikona is a Sanskrit word which signifies a triangle and is one of the widely used mythicalgeometric symbol. It is used to assist in meditation, and in different yantras. A trikona symbolises the consciousness of Shiva. So you have a triangle and a 9. You have the goddess symbolism connected to the 9=copulation. It is no different than the Seal of Solomon when both triangles are joined representing a union between their god and goddess. Or you have the divine masculine copulating its “divine wisdom” as is probably the case of the symbol of THC. They want you to reach a “higher consciousness” through smoking weed. I for one know this to be true. So do you see why I say if you’re smoking weed you are communing with Shiva? Even the symbolism tells us this. Ever heard of Kona Gold? What about Cheeba? I hope your getting it. A few days ago I said one, off the cuff comment, about how “smoking weed is communion with Shiva” and a lot of people lost it. Then all the medicinal smoking Christians come out of their grow closets were claiming this and that and giving their testimonies of how life altering and changing using marijuana was for them. Well let me give you a little testimonial. I had smoked weed for over 15 years every single day all day long. Not only did I smoke weed but I sold weed. This was my income as I was in a band playing shows. I was delivered from weed, alcohol and drugs 14 years ago on January 18th, 2003 when I was born again. If I hadn’t had been delivered, I would have never quit any of it and would be back to everything I did in the past, this very day. I had dealt with a lot of shady people when dealing with marijuana. It not only brought around stoners, but it also brought around Tweakers and heroin addicts. I can tell you 100% without a doubt that the weed that I had was so addicting, that at even at the time of selling and smoking it, I even questioned what was the spiritual entity behind this drug. I used to get a lot of my weed from across the border and in South America. I know what an addict looks like because I was one. These people used to feign for this weed like it was a shot of heroin or a line of dope.They literally acted like crackheads. I thought it was so strange that I made the comment to the person I used to get the weed from and this is what he told me. He said that he knew for a fact because he had witnessed it, that with the weed that he was giving me, it had a spell over it. He said these people would “pray” over it before sending it over the border. I said “like witchcraft?” and told not “like” witchcraft but witchcraft. I was blown away. This explained why i was seeing people eating this stuff up like potato chips. He told me that this was a normal practice that would cause addiction. And it’s real because I saw it first hand. This is no joke. If you don’t think these people curse this weed like they did when I dealt with it 15 years ago, you are a very gullible person. I guarantee you they perform witchcraft and spells over this medical marijuana that they have in these government run dispensaries. In my opinion, the FDA and the government that control this marijuana are a hundred times worse spiritually then any private grower that I ever got my weed from. This is not something to play with people. This is why I say that if you were smoking weed you’re having communion with Shiva. I know for a fact that there is a spiritual concept and entity behind the controlling of this drug. The same people who you want to use the terminology of pharmakeia in the Book of Revelation, are the same people who wanted to know my that marijuana is in that category. We know this for pharmekia mentioned in the Book of Revelation is connected to Witchcraft and spells that are done over it. Medical marijuana, whether it be CBD oil or the THC that you actually smoke from the plant, are all part of this for pharmekia that will lead people astray in the last days. Pills, medications, whatever it may be, it no different that medical marijuana. The really strange thing is, is now you can watch videos of people sprawling around on the floor demon possessed and most the time you see these videos they are on ice or bath salts. But the majority of these videos are people who smoked this synthetic weed that they sell over the counter. This is 100% genetically modified fake weed that they pass off that you’re smoking real weed. If they can do this with a synthetic drug and pass it off as fake marijuana, don’t you think that they will do that with real marijuana? And what’s even crazier about these videos that are coming back out with these demonic people, is that if you read the comments some of these people know the people in the videos. And they straight up tell you that they smoke weed not some synthetic marijuana. Don’t you think there’s a reason in the state of California that now you can’t have your CCW license to carry a weapon if you have a medical marijuana card. Explain to me why the government wouldn’t want somebody who smokes medical marijuana to have a CCW card. Watch the video below and remember that this came out April 18th, 2017. So this video is a year and a half old and if they are talking about it then, then it was already happening at least 5 years prior. This is a fact. Do you realize (as of 2017) the medicinal marijuana you get is now 14% thc and o.o2% cbd? When I smoked weed thc was at 0.2% and cbd was at 40%. This means the medicinal cbd oil you actually use now, today, right this second is close to nothing in comparison to 20 years ago. Why is that? Because it’s all genetically modified and George Soros has his grubby little hands in this addiction too. You now have Monsanto patenting strains that are used for “medicinal Marijuana”. The weed is stronger now and has more THC (the chemical that gets you high) in it because it is in fact genetically modified. It didn’t somehow magically get better. It got better in a Army pharmaceutical lab. And with the THC content going up almost 40% (in 2017) the CBD content of the hemp plant itself went lower…like really low. So this means that the CBD oil is tainted that comes out of this plant due to genetic modification. What you see is not always what you get. This is the man behind Sophia and AI, Ben Goertzel repping CRISPR. If you think this is the only plant that bears seed that is genetically modified, your very gullible. And wait until CRISPR gets involved with EVERYTHING including your mary jane. Keep thinking the way you do. Or maybe CRISPR is already part of this plan to genetically modify Marijuana that will in fact affect people? “Labs like Phylos Bioscience and Steep Hill formed within the past decade are now using DNA sequencing techniques on various strains of cannabis to begin to unlock what makes marijuana tick. Labs are able to tests for different markers in marijuana’s DNA that coincide with the number of terpenes or the non-psychoactive cannabinoid, known as CBD. Gaudino said the work to map the marijuana genome is just in its nascent stages, but that its relevance in the modern market is already at work….President and chief scientist Samantha Miller of the Santa Rosa-based Pure Analytics laboratory “said genetic modification technology like the CRISPR-Cas9 could certainly be used on cannabis to obtain different levels of cannabinoids and terpenes. Do you remember when Obama came out that he had puffed tuff in the past? “Apparently, back when President Barack Obama would get high with the Choom Gang, he was tokin’ on some weak product by today’s standards. After Obama told The New Yorker that marijuana is no more dangerous than alcohol — which opened the door to a broader conversation about legalizing or decriminalizing a drug that’s on the federal government’s most restrictive list, Schedule I — former Rep. Patrick Kennedy, D-R.I., said the president needs to brush up on his pot knowledge. Even a Democrat can admit the truth. “Legal hurdles to exploring marijuana’s medicinal properties might soon fall in the wake of the US Food and Drug Administration’s (FDA) first approval of a cannabis-derived drug. On 25 June, the FDA announced its approval of Epidiolex — a treatment for epileptic seizures that is based on a cannabis compound called cannabidiol (CBD). The US Drug Enforcement Administration (DEA) has until 24 September to re-classify Epidiolex so that it’s legal for doctors across the country to prescribe it. Many researchers hope that the agency will re-classify CBD itself, instead of just Epidiolex, so that they can more easily study this non-psychedelic component of marijuana. I hope you understand that all the “medicinal” marijuana including your cbd oil is mandated through the Federal Government. And if you don’t think these clowns curse this stuff through ritual before it even gets into your hands your seriously trippin. Tell me I don’t know what I’m talking about. I was in this “game” before I got saved 14 years ago and this was when weed wasn’t cool. There is a reason why some of you people want to fight tooth and nail when someone like me says what I say about smoking or ingesting Marijuana in one form or another. This is a sin. Period. Shoot…I use to get mad to when I was an addict. Truth hurts. Now to make it fair, there are those in the past who say that any genetically modified marijuana is nothing but fantasy…fake news. The comments below were from 2013 and pay special attending how he claims genetic engineering is safer than mutagenesis (what they were doing then). And if you want to research medical marijuana you have to go through the government. Now why is that? “Thirty states and the District of Columbia have now legalized medical marijuana. But the plant and its compounds are still illegal under US federal law, consigned to the most restricted category of substances — schedule 1. Only the few researchers who sink the time and money into complying with federal rules for handling illicit substances can work on cannabis. Far fewer barriers block research on drugs in less restricted categories, such as oxycodone (OxyContin) — a commonly prescribed opioid — or cocaine and ketamine. Wait until Pepsi Co gets involved. Remember HEK 293? Now I get it, people use marijuana plants in the form of hemp. They make clothes, paper, rope, all kinds of things. I’m not going to argue that. My bone to pick is with those that ingested and those people will argue that they aren’t getting high off of it because they want to get high but they are getting the medicinal use that they need. To me that kind of statement makes no sense whatsoever. It doesn’t matter what reason you’re using it for a few or ingesting it and it is giving you a head change. you go from being sober after either smoking it or ingesting it another way. Now I’ve been told that those who take CBD oil do not get the head change in the sense of being high. But we go right back to the whole thing that the CBD oil from marijuana plants is genetically modified and it’s tainted and it is not what you think it is. Despite being used for a variety of purposes including medicine, food, clothing, paper and weaponry, one aspect of cannabis rarely mentioned by the early Chinese is its psychoactive qualities. In 2008, Chinese archeologists unearthed a two-pound stash of cannabis that dated back about 2,700 years. Through study published in The Journal of Experimental Botany in 2008, the superbly preserved plants were high in psychoactive properties, but they were more likely used for medicinal purposes and/or as an aid for divination. Did you notice that they said that they use it for divinity or to communicate with spirits? One of the oldest cultures in Civilization is talking about smoking weed and communicating with demons. If you do not see a problem with that and you smoke weed then you obviously have other issues that you need to deal with. The article mentions Pen Ts’ao Ching. [1,2] Medical Cannabis [4,5] is spicy when eaten [7-8] but has poison [9-13] good for the five organs, to bring the bodies Yin Yang into balance. And this is from Joseph Mercola. The last paragraph that opens his article. This is the point I’m trying to drive home…medicinal or not. Pictured here are two works by Robert James Devine, a reverend who published several vehement tracts warning of the drug’s lethal dangers in the first half of the twentieth century. Devine draws parallels between marijuana and Moloch, the ancient Ammonite god: both are false idols, and both demand the sacrifice of children. Lending potency to this metaphor is J.N. Curry’s cover illustration of The Moloch of marihuana, in which devilish drug peddlers fling hapless figures onto the burning hands of Moloch’s brass statue, while a scholar, a policeman, and other complacent citizens avert their gazes. 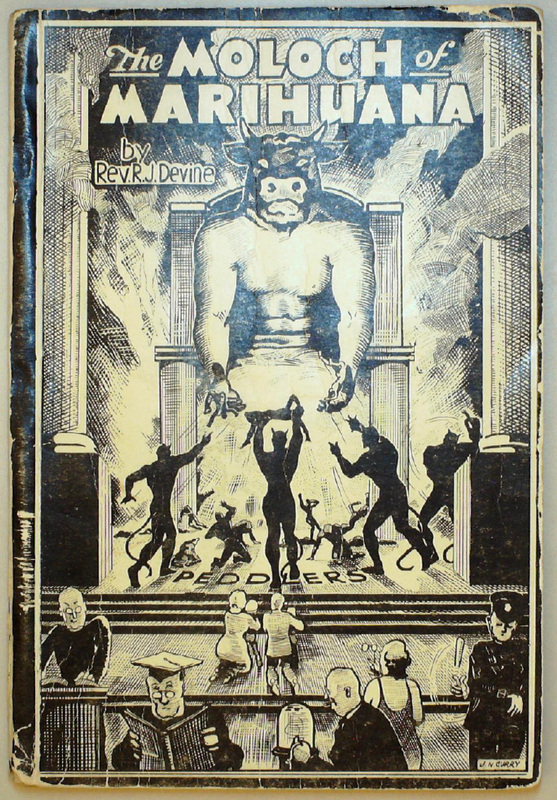 Perhaps unable to improve on artwork so striking, Devine repurposed his cover image of dread Moloch for a second publication, Assassin of youth! : marihuana. This volume is largely an expanded and rearranged edition of Moloch of marihuana, and includes a frontispiece picturing several “reefers” or “muggles” and a marijuana leaf for the vigilant reader’s edification. This one is for those yuppy medicinal marijuana cannabis loving “Christians”. Maybe you should just be an elevationist like these clowns in Denver. Four interlacing pyramids of the Elevationist. I say clowns for good reason too. When people are on DMT, (next these Christians are going to say DMT is ok to do), they see these demonic images that are fractal and these fallen angels show up in the form of clowns. Research it. I’m not making this up. Just ask Satanist Joe Rogan. Look at the art in the “church”. They are fractal and what is that on there walls? A sheep across from a bull. Why a bull? Because it represents their god. Figure it out…. You have the all seeing eye symbolism everywhere along with the bird like creatures. Think augering. Witchcraft. Notice the sheep above a black Phoenix or is that a crow rising up? I guess for this section the first thing I should bring up is the movement in the last 10 years where people (so called Christians) are smoking the baby Jesus. Get online and either go to Google or YouTube and type in smoking baby Jesus and you will see what I’m talking. These people act like they have a joint in between their fingers and are smoking it like they’re smoking weed. They believe they are inhaling the holy spirit. We know they are inhaling something but not the Spirit of God. This is witchcraft and a form of strange fire. Remember what i said about the Chinese and smoking weed was communicating with demons? At least the Chinese admit it. Why would these people think they were smoking and inhaling a spirit? Where could they possible get that from? If you don’t know the answer then please start at the beginning of this article. Click on the picture below to see how ridiculous this website is. Blasphemous. Now I think I should mention the Hindu religion. There are a lot of Scholars that believe The Vedic texts are some of the first text ever written and because of this they believe that every culture and god and goddess stems from these texts. I can see that to be true in some cases but in fact it only confirms what the Bible says and parallels most of it. Singe of the names obviously have changed. Even when researching Petra there seemed to be a connection to the Hindu religion in the statues and architecture. With that said I want to bring up there God man Shiva who some believe was Ham and others believe to be associated with Nimrod. He is the God of destruction and is similar in other cultures as Osiris and Apollo. I am going to give you a few articles that will tell you in their own words that Hindus actually do commune with Shiva and this is through smoking weed. Remember when I said that off-the-cuff comment that smoking weed is having communion with Shiva? This is the reason why I said it, because it is true. The reason why I bring up Shiva and the Hinduism religion as far as smoking marijuana goes, is because it’s one of the oldest religions, and other Pagan religions copycat Hinduism. This is why you see Rastafarians in Jamaica with dreadlocks smoking weed and claiming jah gave them marijuana. Jamaicans weren’t the first to have dreadlocks. Look at the images in the videos below and you will see that Hindu men have dreadlocks. “Shiva is one chill deity. He’s one of the three major gods in the Hindu religion. And he has a penchant for pot. “Shiva loves marijuana. So we come to share Shiva’s prasad [offerings] with everyone else,” explains a 60-year-old holy man who gives his name as Radhe Baba. It’s the eve of the festival of Shiva Ratri, or “The Night of Shiva” — March 7 this year. The celebration marks the day Shiva saved the universe from darkness and married the goddess Parvati. Groups of dreadlocked Hindu ascetics sit around small smoky fires puffing on clay pipes at Pashupati, one of Nepal’s holiest Hindu temples, in the capital city of Kathmandu. Hundreds of holy men (and some women) have traveled from around Nepal and India for the festival. They spend the days before the holiday alternately praying and lounging to prepare to commune with Shiva. And they also smoke hashish. Marijuana smoke mingles with the bonfires. Both are symbols of religious devotion. Shiva, it’s believed, used marijuana both to relax and to focus better for meditation. “Fire represents God,” Ram Das Bairagi explains. “We do [bonfires] for Shiva, to call him. Maybe he will see the fire.” Bairagi, an ascetic who lives at Pashupati temple year-round, has wrapped his long dreadlocks in a leopard print scarf, representing the animal skin Shiva wears. His body is white from ashes, taken from the cremation sites at the temple. “The sacred use of cannabis in Hindu religion is associated with the devotion ofLord Shiva, though it is illegal and prohibited as per the law and order, but the government allows this around the Shiva temples by the authority of praising Lord Shiva, especially on Shivratri festival. This practice can be witnessed at the popular Shiva temples, such as; Biswanath temple,Mahakal temple, Baidynath temple,Tarakeswar temple etc. Now the question is why this notorious practice of intoxication is associated with the reverence of the God of the Gods (Devadidev, Mahadev)? “According to puranas during the ‘Samudramanthan’ (a joint-venture ofdevas andasuras to gainamrita), Shiva consumed all the poison (Halahal), to protect the creation from its noxious effect, which caused immense heat and Shiva started getting restless, there marijuana undertook the task of cooling Shiva, along with some other elements, such as; ‘bilwapatra’ (Bell leaf), Ganges water. So it is believed that, Shiva created cannabis from his own body to purify the elixir. So marijuana is considered holy (amrita) by the Hindus, especially by the Shaivites (sect of Shiva). Now as per the legends of Lord Shiva, he poses the most versatile nature among all other Gods. He is a passionate dancer (Natraj), a dedicated lover (Umapati), a fierce fighter (Birvadra), a lord of terror (Bhairav), who dwells with poisonous snakes around his neck and holds the flow of river Ganga upon his tress (jata). He is addressed as Rudra due to his anger and devastation, due to his anger he beheaded his little child ‘Ganesha’. Also from the Mahabharata, we learn that Shiva and Parvati jointly invented the game of gambling with dice (chausar), which implies he inspired gambling as well. So Shiva can be considered as rock star among Gods, may be for these attributes it is imagined that he would use cannabis himself. There are different types of cannabis used in different forms and all are accepted as the ‘prasad’ of Lord Shiva by the Shaivities. Which are, 1. ‘Bhang’ usually consumed as an infusion in beverage form, and most commonly used form of cannabis in different religious festivals, consists of the leaves and plant tops of the marijuana plant. 2. ‘Ganja’ is smoked with the help of ‘chillum’ (a typical clay pipe), consisting of the top leaves of the marijuana plant. 3. ‘Charas’ also smoked, consists of the resinous buds and/or extracted resin from the leaves of the marijuana plant. The earliest mention of cannabis has been found in The Atharva Veda (1000-600BC), as one of five sacred plants, having numerous medical benefits and Shiva lives in it, also described cannabis as a source of happiness, joy-giver, liberator and that is a gift of Lord Shiva to mankind to aid in ‘sadhana’ (Devotion), to help them attain delight and lose fear, as it releases one from anxiety also provides the visions of the gods. According to some scriptures, dirking of ‘bhang’ cleanse the sins and unite one with Shiva, but in contrast foolish drinking ofbhang without rites is considered as a sin. Upon eating hemp (the fiber of the cannabis plant) the euphoric, ecstatic and hallucinatory aspects, leads someone to an other-worldly plane, so the plant became accepted as a special gift of Shiva, and a sacred medium for communion with the spiritual world, which helps to meditate with utmost concentration. You can see clearly that in Hinuism, smoking weed without the intent of communing with Shiva is a sin. Do you honestly think that when you smoke weed without Shiva in mind your not committing a sin according to Scripture anyways? Don’t fool yourself. Your getting facts from the horses mouth here and like it or not, they know what they are taking about. Take a look at what Rastafarians believe because they actually mimic what Hindi do. “When R.J. Katz takes a hit of weed, he first asks himself why he’s doing it. “I realized if the intention is a conscious thought, I’m able to hit the pipe with any intention in mind. So I decided to try it as an offering to a higher power or God, or Krishna [one of the mostly widely worshipped Hindu gods],” says Katz, a 20-something musician and activist. He likes to smoke before practicing yoga because it helps him focus inward and deepen his practice of meditation. Thanks to Bob Marley, Rastafarianism is perhaps the most obvious example of a religion that integrates cannabis, conjuring up images of dreadlocked reggae artists in a haze of billowy weed smoke somewhere in Jamaica. Rastas believe that using ganja, also called the holy herb or the wisdom weed, is sacred; in fact, using weed merely to get high is condemned. Smoking the holy herb is a ritual, beginning with a common prayer: “Glory be the father and to the maker of creation. As it was in the beginning is now and ever shall be World without end. Jah Rastafari: Eternal God Selassie I.” It’s believed that Emperor Haile Selassie I of Ethiopia was the Messiah. Rastas also believe that the “Tree of Life” is a cannabis plant, and turn to passages in the Bible to support the use of weed: “The herb is the healing of the nations” (Revelation 22:2), “Eat every herb of the land” (Exodus 10:12), “He causeth the grass for the cattle, and herb for the services of man” (Psalm 104:14). Esteemed as a portal to understanding, ganja is commonly used in Rastafari reasoning sessions, or community meditation gatherings. During these sessions, a group commonly smokes from a chalice, or shared pipe, helping them share ideas, evoke visions and strengthen the community. Established in the 1930s, Rastafarianism is a fairly recent 420-friendly religion, in contrast with Christianity, Hinduism or Judaism. In India, cannabis is also sometimes called “ganja,” derived from the Sanskrit word “ganjika.” Hindu tradition sacralizes cannabis in its connection to Lord Shiva, god of destruction and transformation. Shiva is also the lord or “father of yoga,” explains Govind Das, owner of Santa Monica’s Bhakti Yoga Shala. It’s said that all yoga practices come from Lord Shiva. “He’s also considered the lord of mind-altering substances, and one of those that he’s most deeply associated with is cannabis in the form of ganja, the flowers, charas, a type of hashish, and bhang, a potion made with the leaves, ghee and specific herbs,” Das says. Bhang is considered to be a “sister” of the goddess and holy river Mother Ganges in Northern India. According to Hindu mythology, Shiva would often leave the house to wander in the woods or meditate in the mountains. To lure him to stay home, Shiva’s wife, the goddess Parvati, decided to make him bhang, though she wouldn’t say what was in it. “It was an extremely powerful concoction, and he drinks it and because of that, is able to stay home and be with his family,” Das says. The annual festival Shivaratri is the holiest day of the year for Shiva devotees. On this day, it’s very accepted to take some form of bhang, ganja, or charas — smoked out of a chillum, or clay pipe. For Hindus, and especially Shiva devotees, cannabis is used as a sacrament, its use always preceded by a chant or prayer, such as “Jai Shiva Shankara Hare Hare Ganja” (“Shiva the joy giver, grant us infinity from the ganja”). In the yogic philosophy, it’s key that cannabis is always used for meditative and spiritually uplifting purposes, rather than for recreation, Das says. Shiva devotees commonly use cannabis in the morning, right after their bath, and right before practicing yoga, including the postures and devotional chanting. If you want to continue to read the twisting of scripture and a horrible interpretation to justify in using marijuana, I suggest you go ahead and keep reading this article all the way through. You will see that they twist scripture to the point that none of it is even legit. You can obviously see by this article by La weekly that their intent for smoking marijuana is for a religious experience. Being that they make it a religious experience they are absolutely 100% communion with a evil spirit and not the Lord God of Israel through our Lord and Savior Jesus Christ. In the Vedas, the sacred text of India, cannabis (bhang) is listed as one of five sacred plants, and the Hindu god Shiva is referred to as “Lord of the bhang,” meaning the Lord of cannabis. “According to the Mahanirvana, “bhang is consumed in order to liberate oneself,” and liberation is the path to immortality. The ancient Egyptians, Persians and Greeks also used cannabis in a variety of ways, including medicinally and for spiritual upliftment. References to cannabis are even found in Islamic, Judaic and Christian texts, although an error in translation appears to have crept into the Bible along the way. The original Hebrew term “kaneh bosm,” or cannabis, is found several times in the Old Testament.” (https://articles.mercola.com/sites/articles/archive/2018/07/07/cannabis-a-lost-history.aspx?utm_source=dnl&utm_medium=email&utm_content=art1&utm_campaign=20180707Z1_UCM&et_cid=DM218938&et_rid=357757405) To say “kaneh bosm” is cannabis through word association, then you better say Mara Jnana is marijuana. Read the next section. I can’t be dogmatic about the word association here so be careful on the Jewish interpretation. If you want to support the use of marijuana, medicinal or not, you need to support people like Chris Rice who supports ish psychedelics including Marijuana as to achieve this SINGULARITY that they have been waiting for so long. This video was posted on the above link from Mercolas website. So do you need more because I can give you qoute after qoute of this communing with Shiva and other goddess type spirits when smoking weed. I’ll leave you with one more article. Smoking weed welcomes demons, it doesn’t ward them off like the article below wants you to believe. Using Marijuana is a religion unlike true Christianity. Ganja (from the Sanskritword Ganjika, used in ancient India), is a spiritual act, often accompanied by scriptural study; it is a sacrament that cleans the body and mind, heals the soul, facilitates peacefulness, brings pleasure, exalts the consciousness, and brings us closer to God, or one should say realize unity further. You should burn the herb when in need of insight from Ajah. The herb is the most sacred form of the mother (matter) when it is burned it and the solid matter transforms into smoke it symbolizes how though material birth we reach spiritual liberation. Personal consumption for religious purposes is a valid reason for partaking in the smoking of ganja. It is not being abused using it in this way, and to the Ajah is not seen as intoxicating but enlivening, as it is a gift from the mother-earth given to us to nurse the spirit. Shiva is the oldest known godhead figure in the world. Devotees of Shiva sometimes meditate by drinking a milk and cannabis mixture prepared by priests (Bhang). Sadhus and other devotees endlessly walk around India searching for the spiritual oneness with Shiva. These Sadhus also smoke ‘Charas’ and ‘ganja’ from chillums. It is widely accepted amongst Hindus that Shiva takes Bhang. What’s disputed is the consumption of it by ordinary mortals. Most Hindus do not know their ancestors used to take cannabis whenever they saw fit. Consumption of Bhang wasn’t always reserved for the Gods and holy days. In fact, not so long ago it was considered an insult to refuse Bhang. I believe this change occurred no earlier than 1900, after the Indian Hemp Commission’s report was released in the late 1800s. Cannabis held a preeminent place in the Tantric religion to combat the demonic threat to the world, the people sought protection in plants such as cannabis which were set afire to overcome evil forces. Hemp was used in Ancient Japan in ceremonial purification rites and for driving away evil spirits. In Japan, Shinto priests used a gohei, a short stick with undyed hemp fibers (for purity) attached to one end. According to Shinto beliefs, evil and purity cannot exist alongside one another, and so by waving the gohei (purity) above someone’s head the evil spirit inside him would be driven away. Clothes made of hemp were especially worn during formal and religious ceremonies because of hemp’s traditional association with purity. In south central Africa, marijuana is held to be sacred and is connected with many religious and social customs. Marijuana is regarded by some sects as a magic plant possessing universal protection against all injury to life, and is symbolic of peace and friendship. Certain tribes consider hemp use a duty. The earliest evidence for cannabis smoking in Africa outside of Egypt comes from fourteenth century Ethiopia, where two ceramic smoking-pipe bowls containing traces of excavation. In many parts of East Africa, especially near Lake Victoria (the source for the Nile), hemp smoking and hashish snuffing cults still exist. The use of marijuana is as old as the history of man and dates to the prehistoric period. Marijuana is closely connected with the history and development of some of the oldest nations on earth. “…that early man experimented with all plant materials that he could chew and could not have avoided discovering the properties of cannabis (marijuana), for in his quest for seeds and oil, he certainly ate the sticky tops of the plant. Upon eating hemp the euphoric, ecstatic and hallucinatory aspects may have introduced man to an other-worldly plane from which emerged religious beliefs, perhaps even the concept of deity. “Shamanistic traditions of great antiquity in Asia and the Near East has as one of their most important elements the attempt to find God without a vale of tears; that cannabis played a role in this, at least in some areas, is born out in the philology surrounding the ritualistic use of the plant. Whereas Western religious traditions generally stress sin, repentance, and mortification of the flesh, certain older non-Western religious cults seem to have employed Cannabis as a euphoriant, which allowed the participant a joyous path to the Ultimate; hence such appellations as “heavenly guide”. Now please, tell me this isn’t a sin and when smoking you arent communing with devils? Now I want you to notice the dancers at the beginning of this Shivas weed smoking followers. They represent the demons of Mara. Who is Mara? Keep reading. Now if you decide to search where the name comes from Your going to get all different kinds of theories. From being of Chinese origin to Spanish origin to Mexican origin. Most believe it is as recent as mid 1800’s. You can search the name yourself and see where it comes from. Now when I was looking through Hindi research I came across a god name Mara and the word Jnana. The name Mara means bitter in Hebrew. “Gaelic word for “sea”. A Hindu goddess of destruction, death, winter, and the moon. Of Hebrew origin, and its meaning is “bitter”or “sorrow”. In Hinduism, Mara is the goddess of death and offerings would be placed at her altar and in BUDDhism she is a demon. Notice she looks like she almost has a beard and is blue and she is the “the personification of the forces antagonistic to enlightenment.” Māra is also the highest-ranking goddess in Latvian mythology, Mother Earth, a feminine counterpart to Dievs. She takes spirits after death. Now this is just my own thought but I found it strange that both of the words in Sanskrit reminded me of marijuana. Mary Jane is a folk name for it and it just so happens to be a womans name. Did you realize that some people who smoke weed refer to her as a goddess? In my opinion there’s definitely a spirit behind marijuana. Is that a goddess? I don’t know. But the spirit behind marijuana makes people act strange whether it’s good or bad. I am in no way saying that these two words in Sanskrit or from where marijuana comes from. I just find it strange when they were put together they obvious look like marijuana. You have a word that represents a demon and they goddess of death and destruction and another word that represents a knowledge that you get from a Divine encounter. Marajnana. That is all I’m saying. So please do not put words in my mouth and say I’m trying to make up something that’s not there. I’m not trying to do that. I’m just telling you I find it interesting that it does look like that. And why is it called weed? Well in my thought, a weed is something that needs to be pulled and does more harm than good. Or what about pot? Ever heard the phrase that’s like the pot calling the kettle blacl? This is definetly the epitome of smoking weed. I won’t entertain the scriptures that people twist to fit their belief in smoking weed. From the fire references to the cloud references to the creation “every herb is good” scripture. They are ridiculous and not worth even disproving them. They are easily disproved if you have discernment through Jesus Christ. I do want to say that the Genesis 1 reference is used most for their defense. They say being that God said it was good than its ok. Remember, that was before Adam ate of the tree of knowledge of God and evil and Eve was deceived. At that point everything changed. Not only that, creation fell into sin and it to awaits redemption. And if you want to take the book of Enoch into account, he mentions how the fallen genetically modified not only people and animals but also plants. I believe this is where the smoking of marijuana came into play. Being sober minded in scripture means you are not to have your mind clouded by anything. That could be the cares of this world to something that would literally cloud your mind like a drug or alcolhol. We are not to literally intoxicate our minds with any substance. Here are a few examples of being sober in Scripture. 1 Peter 4:7 – But the end of all things is at hand: be ye therefore sober, and watch unto prayer. Titus 2:2 – That the aged men be sober, grave, temperate, sound in faith, in charity, in patience. Titus 2:6 – Young men likewise exhort to be sober minded. If your mind is “cloudy” when you are in a certain situation it could get very well affect your judgement and final decision. Now onto your body being a Temple of God. 1 Corinthians 3:16-17 Know ye not that ye are the temple of God, and that the Spirit of God dwelleth in you? If any man defile the temple of God, him shall God destroy; for the temple of God is holy, which temple ye are. 1 Corinthians 6:18-20 Flee fornication. Every sin that a man doeth is without the body; but he that committeth fornication sinneth against his own body. What? know ye not that your body is the temple of the Holy Ghost which is in you, which ye have of God, and ye are not your own? For ye are bought with a price: therefore glorify God in your body, and in your spirit, which are God’s. Your body is the temple of the Holy Ghost] What an astonishing saying is this! As truly as the living God dwelt in the Mosaic tabernacle, and in the temple of Solomon, so truly does the Holy Ghost dwell in the souls of genuine Christians; and as the temple and all its utensils were holy, separated from all common and profane uses, and dedicated alone to the service of God, so the bodies of genuine Christians are holy, and all their members should be employed in the service of God alone. And ye are not your own? Ye have no right over yourselves, to dispose either of your body, or any of its members, as you may think proper or lawful; you are bound to God, and to him you are accountable. Romans 12:1-2 – I beseech you therefore, brethren, by the mercies of God, that ye present your bodies a living sacrifice, holy, acceptable unto God, which is your reasonable service. And be not conformed to this world: but be ye transformed by the renewing of your mind, that ye may prove what is that good, and acceptable, and perfect, will of God. Galatians 5:19-21 – Now the deeds of the flesh are evident, which are: immorality, impurity, sensuality, idolatry, sorcery (witchcraft) enmities, strife, jealousy, outbursts of anger, disputes, dissensions, factions, envying, drunkenness, carousing, and things like these, of which I forewarn you, just as I have forewarned you, that those who practice such things will not inherit the kingdom of God. Revelation 9:20-21 – And the rest of the men which were not killed by these plagues yet repented not of the works of their hands, that they should not worship devils, and idols of gold, and silver, and brass, and stone, and of wood: which neither can see, nor hear, nor walk: Neither repented they of their murders, nor of their sorceries, nor of their fornication, nor of their thefts. Now I want to end the article like this. If you are a Christian or claim to be a Christian and you smoke weed or take it any other way in any other form, and your biggest argument and defense for doing it, is that you are in pain or have problems, then you are a cop-out as a Christian. If I took a drug or smoked weed every time I was in pain or was having some sort of issue mentally or physically, I would be high every single second of the day. The last two years for me personally has been horrible. I have come under demonic attack in the form of heart problems. Doctos still cannot diagnose what is actually wrong with me. But you see, I know what it is. I know that we are in spiritual warfare and we don’t battle against flesh and blood. The problems we have today are because of these ancient demonic spirits that not only attack me but have attacked people the same way in the last six thousand years. I’m not going to lie to you and sit here and say that the thought of using CBD has never crossed my mind. Last year it did. But that’s as far as it got. A thought. The enemy does this to all of us. We all go through the same things so please don’t sit here and tell me you and I are different when it comes to ailments and problems. We didn’t need drugs for certain things. Tay edu of thinking to me is no different than saying abortions are ok for those women have been raped. It’s not ok. God will make a Way for the mother and her baby. Trust in Jesus. I know through the holy spirit that this is just something that Christians should not do, and it doesn’t matter if you smoke it or it is ingested. You have the comforter here for a reason. Jesus is the Healer who heals people’s afflictions and problems. Marijuana is not your healer nor was it sent here by Jesus to replace the Holy Spirit. If you cannot understand that then you need to get back in your prayer closet and figure it out. God said every seed bearing herb was good. But did He say it was good for getting you high in the form of releaving your pain orvrelaxing you? No He didn’t. Hemp is good for clothing as is oil is good for making tires. You wanna smoke tires too? Ever since I wrote this about marijuana on my Facebook page, I have never seen so many Christians or so-called Christians get mad at the fact the someone is disagreeing with them about marijuana. I thought marijuana was supposed to make you happy and joyful, but it looks like it brings out a little angry side in people. It almost reminds me when I have confronted older women about praying to Mary in Catholicism. You could almost put these two examples side-by-side and they almost look exactly the same. And let me tell you, those women that pray to Mary get really really really pissed off about it and say some mean and nasty things. It’s funny because I specifically brought up the use of smoking marijuana whether it’s medicinal or not. But now everyone wants to come out and tell me to give them a reasoning for say Viagra or heart medicines or diabetic medicines or anything along those lines. I’m not here to tell you about Coumadin blood thinner or atorvastatin or metoprolol or any other psychoactive drug like Valium or Oxycontin or Xanax. I’m specifically talking about how smoking marijuana effects your spiritual life. And if you don’t understand that still then please read the article again. If you don’t want to believe anything I have say that is your free will and you’re right but don’t say God tells me this or God tells me that because you need to be justified by what you believe. To try to discount me because we may disagree is petty and dishonest. Everything I write is based off of factual evidence and truth and when it want, I will immediately take it down and correct it. My past articles stand for themselves. Disagreeing with me doesnt make me wrong. If you don’t like what I write then please do us both a favor and move on. Don’t lose sleep because of me. If you want to get into a bare-knuckle brawl about everything, and how everything is bad then there’s definitely an argument. You can argue that the air we breathe, the water we drink, the food we eat, is killing our bodies. But we have no choice in the matter with these things. And all these things, we aren’t doing out of our own free will or by our own admission. They are forced on us without knowing what is being done to us. By smoking weed you are predetermined on what is going to happen. It is premeditated like a planned murder. So your argument that other drugs or the things that invade our life in general are just as bad is horrible argument. Things we can’t control do influence our mind and cloud it up, but we are not the root cause of it all. Smoking weed is based on your own behalf and freewill to do so. No one has a gun to your head now do they. If you have made it this far then you have heard my side of it. Pray about it, read scriptures and ask the Holy Spirit what He has to say about all of this. Do you really think He wants you to smoke Him out of your life? In just telling you what I think about this whole mess and I believe everytime you smoke weed you are letting a spiritual entity into your mind. Do you think its called a gateway drug for nothing? It is a gateway to your mind for something that you don’t want any part of. James 1: 12-16 Blessed is the man that endureth temptation: for when he is tried, he shall receive the crown of life, which the Lord hath promised to them that love him. Let no man say when he is tempted, I am tempted of God: for God cannot be tempted with evil, neither tempteth he any man: But every man is tempted, when he is drawn away of his own lust, and enticed. Then when lust hath conceived, it bringeth forth sin: and sin, when it is finished, bringeth forth death. Do not err, my beloved brethren.